Mike enjoyed four years as a full-time member of Bill Wyman's Rhythm Kings, fronting the band from 2001 alongside Georgie Fame, Beverly Skeete, Albert Lee, Andy Fairweather-Low and Eddie Floyd on their annual world tours. The Rhythm Kings released their album 'Just for a Thrill' and a fabulous DVD filmed during January 2004 titled 'Let The Good Times Roll', both featuring Mike's extensive roll as a member of the ex-Rolling Stones bassist's touring band. In December 07 he was invited to appear as a guest vocalist with Bill Wymans's Rhythm Kings at one of the most publicised musical events of the year - the final Led Zeppelin reunion at London's 02 Arena, a tribute to the memory of the late Ahmet Ertegun, founder of Atlantic Records. Mike performed alongside such soul legends as Ben E King, Percy Sledge and Sam Moore. 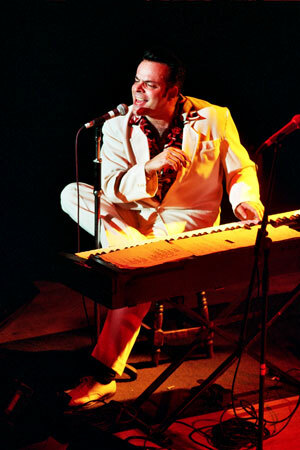 Mike is currently involved in a number of recording projects and touring line-ups, most notably his 6-piece outfit Mike Sanchez and his Band featuring Tom Bull on guitar, double bassist Nick Whitfield, Mike's long term drummer Mark Morgan, Nick Lunt on baritone sax (Jools Holland's Rhythm & Blues Orchestra) and Martin Winning on tenor sax (Van Morrison). This bands performances continuously receive fabulous reviews throughout the blues and rockin' scenes across the UK and Europe. Movinmusic is now taking offers for Mike Sanchez dates. Interested venue owners & promoters can contact us about his availability via e-mail or 0044 (0)1209 860067. © 1996 - 2017 Movinmusic - Contact: mike@movinmusic.co.uk 0044 (0)1209860067 PO Box 38, Penryn, Cornwall, UK, TR11 9YD Skype "Movinmusic"